The work of Walsingham Academy student artists was recognized Wednesday evening at the annual Williamsburg Contemporary Art Gallery High School Art Show. Junior Sidney Woloszynowski received one of the $50 Merit Awards for her body of work including "El Esqueleto" (pictured above) and "Birb." 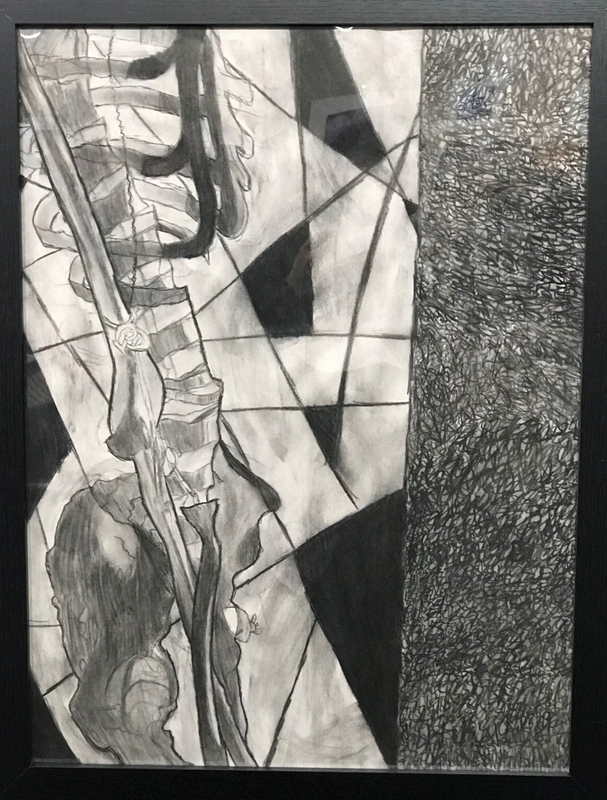 One judge commented: "While the skeleton is a common subject for academic drawing, this piece stands out to me because it is both a close formal study--the artist really looked--yet they also created a strong composition, drawing my eye in and around the entire drawing." Senior Jordan Nagel also received an Honorable Mention Award for his charcoal piece, "Dark Lipstick." In addition to Sidney and Jordan, the work of Walsingham students Zoe Bateman, Rachel Owens, Cameron Pellei, Emilee Pellei, Khatiana Perez, Christin Toth and Yifan Zheng is also on display. The annual show at the Williamsburg Contemporary Art Gallery runs through Feb. 15.